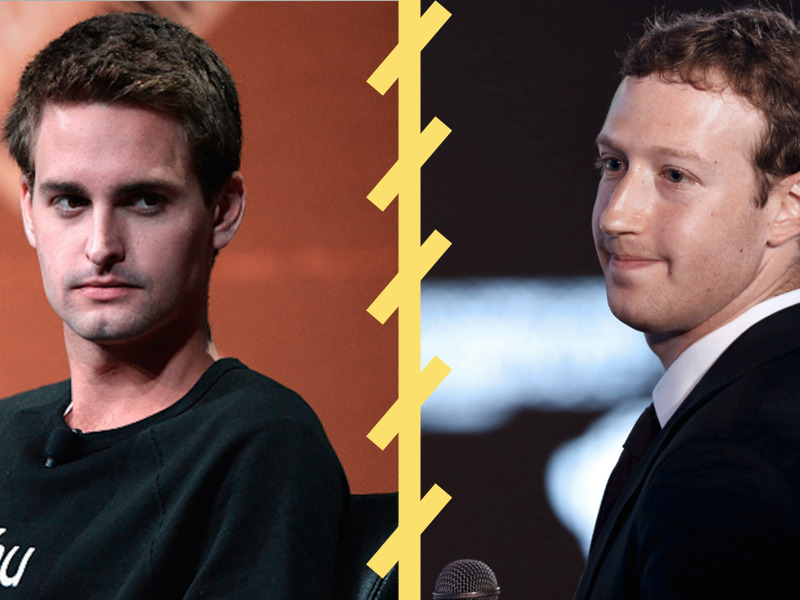 Snapchat CEO Evan Spiegel, left, and Facebook CEO Mark Zuckerberg. When Facebook acquired animated-filter app Masquerade earlier this week, it felt like the social network was hoping for a "third time's the charm" effect in its ongoing efforts to rival Snapchat. Since 2012, Facebook has tried to play catch-up with features from wildly popular messaging app, and this new acquisition highlights the growing tension between the two companies as they tackle digital video and the lucrative advertising dollars that go with it. Since Snapchat first started hooking millennials in late 2011, Facebook has repeatedly, and unsuccessfully, tried to mimic some of its most alluring features. In 2012 it released Poke, an app that let users send self-destructing photos and videos. The company killed it a year and a half later. So Facebook tried again with another Snapchat-like app called Slingshot in 2014, which was reportedly built under the direct supervision of CEO Mark Zuckerberg. The app failed to take off, and in December, it finally pulled the plug on that too. And Facebook didn't just try to build Snapchat clones. It reportedly tried to buy the whole company twice, but CEO Evan Spiegel turned Zuck down both times. Facebook says that it plans to keep Masquerade as a stand-alone app while also incorporating the Snapchat Lens-esque selfie effects into its own products. How exactly it will do that remains to seen, but the Masquerade features will likely start showing up in Facebook's video products, an area where it's putting a lot of focus. Snapchat's 8 billion daily video views are up five times from this time last year. Facebook video, too, has started exploding in the last year. Even more recently, Facebook has started putting huge focus on its new livestreaming-video product that offers much more of the immediacy and ephemerality of the Snapchat experience. Nick Cicero, the CEO of creator-network company Delmondo, which specializes in Snapchat analytics, says that Facebook reached out in January for information about Snapchat influencers and viewership. The two companies did not enter into a business agreement. Facebook has also approached celebrities and other top creators, offering to pay them to use its Live product, according to Re/code's Peter Kafka. Although Snapchat is still in the early stages of monetizing its "Discover" and "Live" stories, they are particularly attractive to potential advertisers because they are opt-in and context-based, with a 100%-engaged audience. More than normal Facebook videos, Live streams have that same sense of immediacy and engagement. As both companies seek to develop the right monetization model for their digital-video offerings, Snapchat has poached one of Facebook's ad execs. Sriram Krishnan, who founded the Facebook Audience Network that places Facebook ads on non-Facebook apps and mobile sites, recently left Facebook to join Snapchat. Two other high-profile Facebook execs that defected to Snapchat didn't last long there — HR head Sara Sperling and revenue exec Mike Randall. But a LinkedIn search shows that at least 20 employees who went directly from one to the other are still there today. As one Facebook low-level employee recently described it to Business Insider, there's a feeling within the company that Snapchat is looking like a bigger threat than ever before.